In celebration of the nearing festivities, I’m blogging every day this week! It’s going to be tough but I’m feeling some Christmassy motivation. My blog has been a little bit stop/start recently, and I’m long overdue a fashion post. Therefore I thought it was about time I shared my favourite accessories to wear during the colder months; and I managed to (although with great difficulty) whittle it down to just five! Go me. Here’s what I picked. First up is this babe of a hat, my River Island Dark Red Oversized Fedora. I’ve fallen in love with floppy hats this year, and this one is no exception. I feel rather Made In Chelsea-esque when I wear this, and it’s one to put on when I’m wanting to make a statement; not so much the one I’d grab when I want to nip to the shop. It’s unfortunately no longer available on the River Island website in this colour, but black is still up for grabs. I’ve owned this oversized snood for nearly a year now, and it’s still my favourite one to throw on over any coat or jacket. 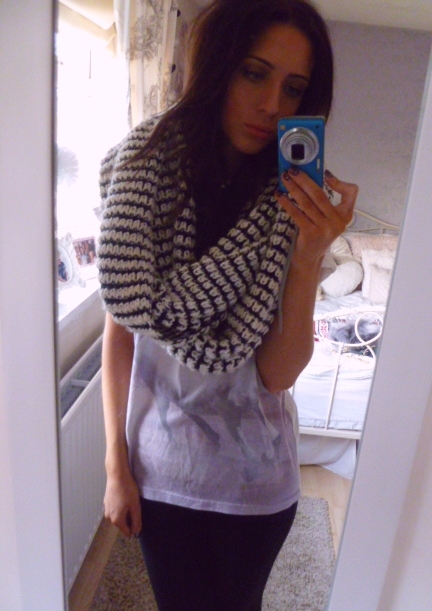 As this ASOS Mono Stitch Snood is monochrome, it goes with pretty much everything, and it’s uber toasty. How could this be my pick of favourite winter accessories without a mention of a little faux fur? 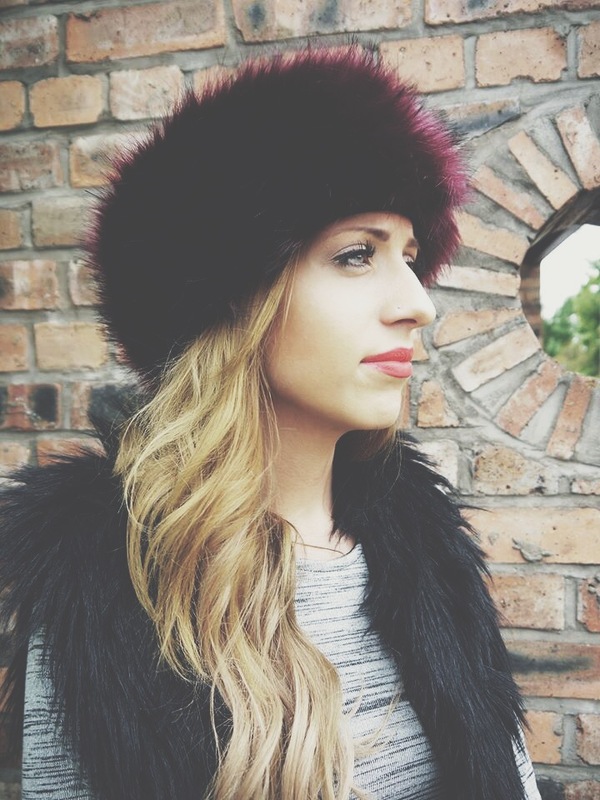 I’ve been a lover of faux fur headwear for years; be it a Russian-style cossack, or a headband like this Peach Chic Boutique Faux Fur Headband in Burgundy (yes, I look different, the picture was taken in August!). I love the colour; purpley-reds are one of my favourite colours to wear during the winter, as you may know from my recent Berry Lips beauty post! Not only do they keep your ears nice and warm, but I find them the perfect excuse to accessorise my head/hair. Any excuse really. I’m absolutely in love with this next accessory; another scarf, yes, but this one’s faux fur! A twist on the fur collar, this one from ASOS has a colour block and is a cute addition to any tee or jumper. 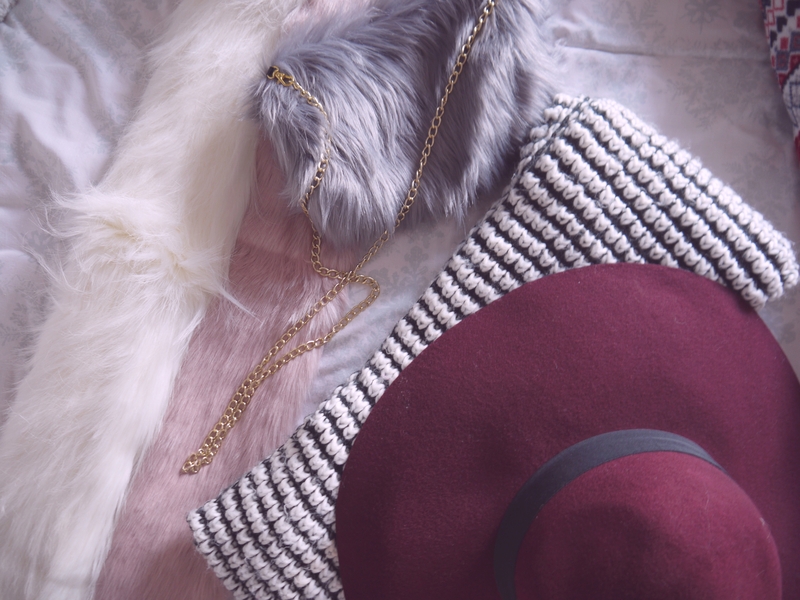 So these were my 5 favourite winter accessories! What do you like to wear during the winter?